Note: For midnight_united, for Valentines. Pre-Xavin. She never says it out loud, because then it would be true. She would be something disgusting and backwards and wrong. And she would be in love with someone she could never have. And she could never be happy. So she doesn’t say it. A spell reversed; unspoken truth. When Karolina flys for the first time, Nico is stunned by the flash of light. She almost wants to stop and bow to this strange goddess she thought she knew. But there are things to take care of, and rules to follow, and other people to think of, and so Nico doesn’t even maintain eye contact or a train of thought. Later, though, in her sleep, she sees Karolina flying high, lighting the sky with trails of energy and she reaches out her fingers and simply touches. It doesn’t burn. Not at all. She doesn’t like ot think she’s fallen for that kind of girl. The kind who always has someone on her arm, someone in her bed. And really, she’s two steps from being that girl herself, but those steps involve the words ‘gay’ and ‘straight’ and she can’t make that leap knowing that she’ll be the only one who Nico ever turns down. The first time its accidental. Of course. She wouldn’t plan on something like this. But the Leapfrog has this way of jolting a certian way mid-leap and her hand will just fly out and catch onto whatever’s free, and once, its Karolina’s, and wow, it’s warm and sudden. She doesn’t know why, but she didn’t expect Karolina’s hand to feel this way, she didn’t expect it to feel like anything, in fact, she doesn’t think she ever pondered Karolina’s hand before. But she will now, because something so warm and uncalloused and soft deserves to be pondered and pondered. Nico tightens her grip, looks down at her lap. It’s hard enough learning to be different, learning to be an alien. But then she has to find a place inside of herself for this other word, this word that she doesn’t think she’s ready for. But like the alien part, she doesn’t think she has a choice. But unlike the alien part, this doesn’t come with the benefit of skies beneath her and rainbows flowing from her fingertips. Well, maybe the rainbow part. But its hard to shine and glow when there’s no reason. Karolina keeps thinking that somehow, things will work out between them. She knows, always, that they won’t, but that doesn’t stop her from considering, continuously, how and why and where and when they could and should and would happen. Except when they do, they don’t. And they can’t. And they won’t. And she doesn’t stop thinking, because she can’t either. She never says it out loud, because then it would be true. She would have utterly missed her chance and ruined her friend’s life. And she would be in love with someone she could never have. And she could never be happy. So she doesn’t say it. Karolina will come home, still loving her. Nico will kiss her this time. But the words will never fill the air between them. A spell reversed; unspoken truth. 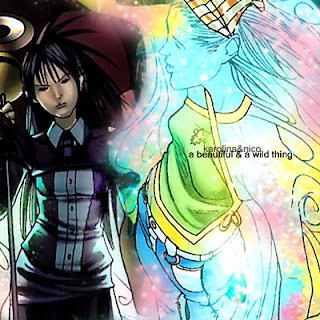 This entry was posted in 2008, drabble, fanmix, femslash, pg-13 and tagged karolina dean, nico minoru, runaways. Bookmark the permalink.